Unique to the digital age is the video content creation industry, one where employees are “users” and employers are “platforms.” In it, workers aren’t owed squat. When there are tech issues, they can visit the support page. When there are platform updates, a lot of the time, the press knows first. 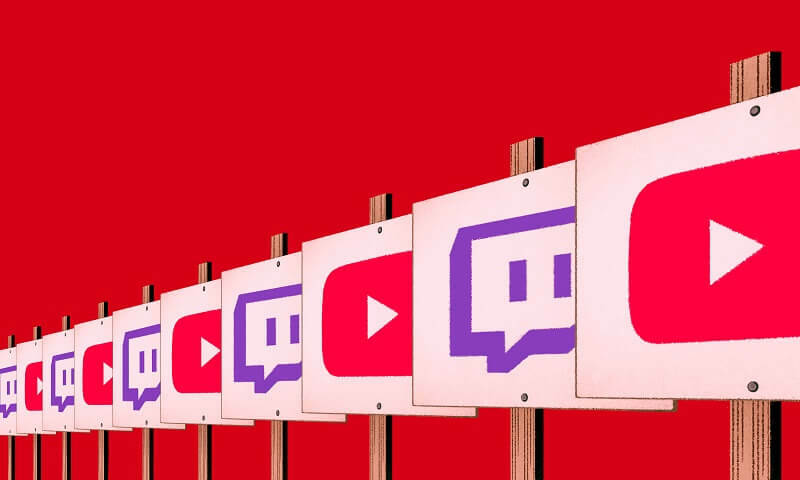 Full-time YouTubers and Twitch streamers, workers whose livelihoods depend on these platforms, are weed-whacking their way through the nascent industry’s first labor issues. And while it’s a new industry, there’s one old, time-tried solution to users’ grievances: organization. It might seem absurd to suggest that full-time YouTubers and Twitch streamers have it all that rough. After all, they make a living playing video games or filming make-up tutorials. But as we’ve seen on several occasions, by hitching their wagons to two giant corporations—YouTube and Twitch, and by extension, Google and Amazon—these video-makers are opening themselves up to all sorts of risk. On top of the 60-hour workweeks common among internet creators, and the myriad of problems we’ve seen stem from that, video platform companies can evade responsibility for their workers’ livelihoods with a simple sleight of hand—they’re providing a service, not a job opportunity. But YouTubers’ revenue streams can disappear without warning. This month, YouTubers are facing a crisis after brands pulled their ads from the platform and videos labeled “inappropriate” were demonetized. YouTubers can appeal through a somewhat enigmatic process. The financial mess is affecting YouTubers as big as PewDiePie, who has 55 million subscribers, and many claim they’re making a fraction of what they did just weeks ago. Few have a clear idea of what’s going on. Among YouTubers, there is widespread foreboding and insecurity. It’s not their first flirtation with financial risk; over the last few months, mysteriously disappearing view and subscriber counts caused widespread panic that lasted months. A lapse in communication or a quick adjustment to technology can seriously mess up full-time content creators’ finances. Twitch is traditionally communicative with its partnered streamers. But, sometimes, its tech can take a toll on users’ pocketbooks. Even something as small as limiting Twitch streamers to one “Community” hashtag instead of two can radically decrease viewership, and therefore, cost them money. Third-party “creators’ networks” capitalize on the problem of communication by promising shady management deals that, sometimes, repossess streamers’ channels or skim off 50% of revenue. It happens often, in part because content creators aren’t talking to each other about pay rate norms or what toxic contracts look like. Many are young. And most sign NDAs, making it a breach of contract to share information. The people who make videos and stream games can’t just cross their fingers and hope that YouTube and Twitch will address the human issues they face working full-time on their platforms. These workers need more control over their livelihoods. They need to take action and organize—that is, to come together and collectively argue for better rights and protections—so Silicon Valley giants stop exploiting their work. It needs to be democratic and it needs to happen soon. “With multi-billion-dollar companies who have the interest of the company at the forefront, the only effective strategy is to come together collectively and push back against that,” Justin Molito, director of organizing for the Writers Guild of America East, told me. On YouTube and Twitch, there are tens of thousands of “partnered” creators, or users who receive checks from these companies’ ad deals. Alone, most are powerless, but together, they would have a bigger, more persuasive voice. “My experience is that, when people come together around a set of demands and resolve to see those demands met, the appropriate corporation will figure out how to structure things,” Molito said. Work in 2017 looks a lot different than it did decades ago, and in three years, half of workers will be independent contractors, like YouTubers and streamers. Perhaps it’s time for labor laws to expand to accommodate the modern generation. In the meantime, there are still plenty of logistics to sort out. But the blueprint for organization already exists in the Internet Creators Guild, which is led by distinguished YouTubers. This guild, which charges dues around $5/month, promises to help professional YouTube creators organize, although it’s not currently able to offer legal protections. Collective bargaining is not a near-term goal for them. It’s just for YouTubers and is still in its planning phases, but its vision is promising. Over e-mail, ICG executive director Laura Chernikoff told me that they currently have 800 members. “ICG was built to address situations related to the power imbalance between a disparate workforce of independent professional creators and the major platforms they work within,” Chernikoff said, “as well as stakeholders like brands, talent representation, and other parts of the industry.” Eventually, they hope to produce reports on what influences brand deals, share information for standardized contracts, and forge communication channels with platforms. Since the ICG is currently only designed for YouTubers (and doesn’t currently have collective bargaining ambitions) Twitch streamers have to find other options. They could wait until the ICG offers support for them or organize with their own association, with or without YouTubers. A few big streamers, ideally ones who have already spoken out against labor conditions, would need to take initiative and launch a guild. That’s the steering committee. It must include big-name streamers who already have a lot of leverage, and ideally, pre-existing human connections at these platforms. That way, a direct path of communication already exists. And otherwise, smaller channels will be afraid to join. What would make a guild more trustworthy than a creators’ network? Money. Organizations like Maker have financial stakes in streamers and YouTubers. Those organizations also have pre-baked relationships with Twitch and YouTube, which means that their interests won’t always align with the people they represent. A guild, organized and run by the workers themselves, would be able to properly and earlestly represent YouTubers’ and Twitch streamers’ agendas when dealing with the powerful companies behind these platforms.